Cinderella sings that "a dream is a wish your heart makes." 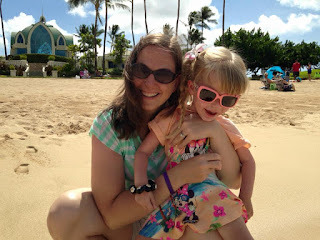 And our dream came true this month with Grace's Make-A-Wish trip to Hawaii. When Grace was diagnosed with INAD in November, we decided we wanted to give her every opportunity that life has to offer. We didn't really want to call it a bucket list, because we felt like that seemed more like an ending, and even though our time with Grace may be short, we still hold out hope for some sort of miracle. Thanks to our awesome community, Grace has had lots of really great opportunities, like dunking a basketball, throwing out a first pitch, earning trophies and even being queen for a day. Kyle and I are still compiling a list of things we want to do with Grace, but we had a chance to do some awesome things in Hawaii this month. Grace's first experience at the ocean. In January, Kyle contacted Make-A-Wish about the opportunity of doing something for Grace. Since she's always loved soccer balls, initially he was thinking about something when the US women's soccer team played at Busch Stadium in April. However, it takes longer than that to get a wish set up, so we started talking about other opportunities with the volunteers. They do a wide variety of things to make kids' wishes come true. From room redecorations to shopping trips and pools to playgrounds, they make sure to take care of each and every child. One of our volunteers suggested a dolphin experience in Hawaii, and since Grace loves the water so much and animals, we thought it was a great idea. Then, she started telling us about the Disney resort near Honolulu, and we were sold. We didn't even realize there was a Disney resort in Hawaii, but we knew Grace would love a chance to see Mickey and Minnie again. It was kind of hard for Kyle and I in the beginning because the child is supposed to make the wish themselves. That just wasn't possible with Grace. We just had to do the best we could to try and pick something that would mean the world to her. Once we decided on Aulani, the volunteers and wish coordinators worked together to make it an unforgettable trip. And they don't leave anything out. We were picked up by a limo at our house and taken to the airport, and they also brought us home at the end of our trip. They provide money to check your luggage at the airport, for meals and even souvenirs for Grace, and she definitely came home with a few new Minnie Mouse items. As the trip neared, I know we were nervous about taking Grace so far from home, but excited at the same time to share such an awesome experience with her. It was a long flight, but Grace did awesome, and the view from our balcony alone made the trip worth it. During the week, Grace got her own private meet and greet with Mickey and Minnie, the chance to kiss a dolphin and the opportunity to swim in the ocean for the first time. For Kyle and I, one of the neatest experiences of the trip was watching Mickey and Minnie interact with Grace that very first time. They discovered she liked to play peek-a-boo, and got right down by her and did just that. Throughout the week when we would see them, they remembered Grace and would get down to play peek-a-boo with her. It was amazing to see her smile. I would have to say Grace's favorite part would have been the swimming, both in the pools at the resort and in the ocean. We took her new life vest with us, and she absolutely loved the water. There were parts of some of the pools that were shaded, so she could even open her eyes while we were swimming. And she loved rocking in the waves of the ocean. We swam out there for over an hour one day, and it was so soothing to her that she even fell asleep. We tried to make sure we did some swimming every day because that seemed to be what Grace liked the best. Although Kyle and I had hoped to tour Pearl Harbor when we were there, it just didn't work out. It was much easier to stay on the resort and just relax. And besides, when I traveled with Mrs. Barb Hewitt, she always said that you have to leave one thing undone so that you have a reason to go back. For us, the Make-A-Wish trip was such a special time just to be together as a family. Grace loved having her mom and her dad all to herself for an entire week, and for us, it was a break from doctors' appointments, therapy sessions, and even INAD. And for that, we will always be truly grateful to the Make-A-Wish organization. Just before we left, we had a chance to share our story at the annual McKay NAPA Make-A-Wish charity golf tournament in Godfrey. McKay has raised thousands of dollars over the years for Make-A-Wish, and this year their goal is to raise $50,000. If you get the chance, make sure and support their efforts, to help make wishes and dreams come true for other families. By supporting Make-A-Wish, you truly are providing families with a once-in-a-lifetime opportunity that they will never forget. I know we won't.